Just like that nightmare I once had! The Behemoth's mysterious "Game 4" finally has a name. The title shares a look and feel similar to the team's previous releases like Castle Crashers and Battleblock Theater, only now things are a little more turn-based. And strategic. Pit People drops our story's heroes into an arena and gives them a chance to fight for their lives. Because that's what we all want, right? After a giant bear shatters the planet, Horatio, Pipistrella, Yosef, Sofia, and Gluten have banded together to try and stay alive. They'll fight off foes using dastardly weapons like icing launchers and explore strange new locations like Randall's Discount Orphanisms. Yep, this is a The Behemoth game, all right. There's plenty that hasn't been said about Pit People so far, such as release dates and specific game details. 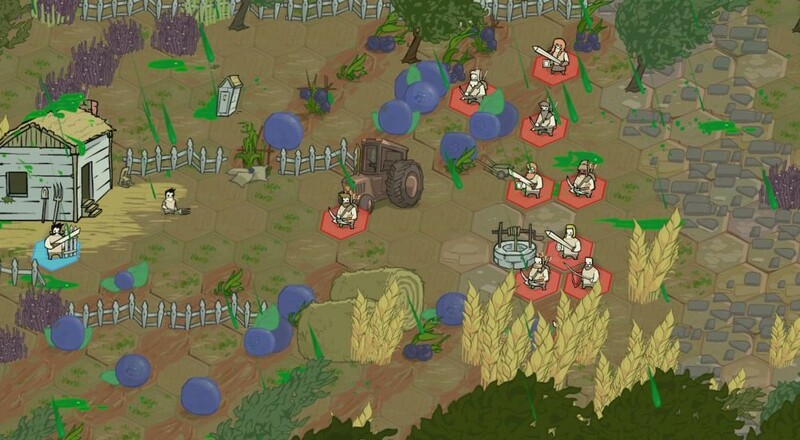 We do know it's a turn-based strategy game, the kind where you move your units, attack, then pray you didn't move them to a stupid position where they get slaughtered. We also know co-op will support two players (four if you count two vs. two teams) on both Xbox One and PC via Steam. Beyond that, it just looks like crazy sorts of fun. That's all.